The American bullfrog, a native to the eastern United States, is a familiar wetlands fixture. Outside of his native range, this large frog is an invasive species and a nuisance. The amphibian is of order Anura and family Ranidae, and the frog is one of few is placed in two genera due to more recent breakthroughs in molecular biology techniques that shown closer relationships to species of other genera. As of 2013, the scientific names Rana catesbeiana and Lithobates catesbeianus are used interchangeably, sometimes together as Rana [Lithobates] catesbeiana. The general scientific classification system starts with kingdom, followed by phylum, class, family, order, genus and species. As a multi-cellular creature, the bullfrog is in the kingdom Animalia, also known as Metazoa. Animalia also contains fishes, arthropods, mammals, reptiles and many others. Bullfrogs belong to the phylum Chordates, a group of creatures characterized by having a rod that extends the length of the body. The subphylum is Vertebrata, or the vertebrates and the bullfrog's class is Amphibia, the amphibians including frogs and salamanders. Bullfrogs, along with other frogs and toads, belong to the order Anura, one of three amphibian orders. Anura happens to be the amphibian order with the most diversity. More than 4,000 species are recognized, and more species of frogs and toads are discovered regularly. Anura has 25 families. Although not always the case, fertilization is usually external. Reproductive variances include viviparous species, aquatic eggs, terrestrial eggs and more. The American bullfrog belongs to taxonomic family Ranidae, which includes the true frogs, ranid frogs and riparian frogs. The classification of Ranidae has undergone major changes in the past, with some subfamilies being removed and placed in other families or as their own families. Most of the members of this family lay aquatic eggs that develop into tadpoles, although a few have direct development. Deciding which genus to put the American bullfrog in is where the creature's scientific name confusion comes into play. 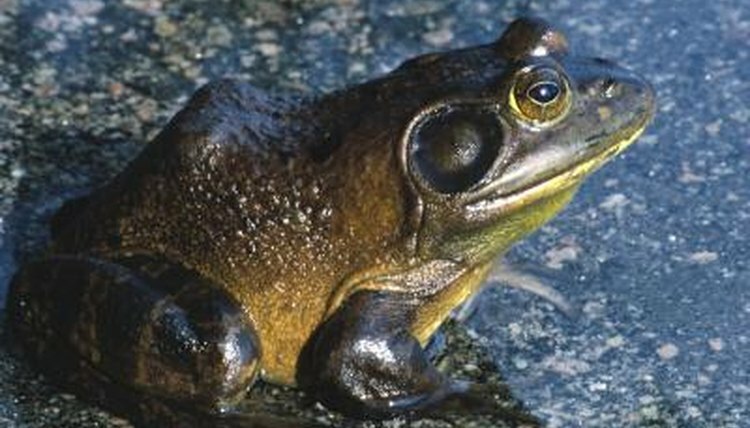 The American bullfrog was classed in the genus Rana from the 1800s to the early 2000s. The breakthroughs that became available to herpetologists in the early 2000s resulted in discovering closer relationships to members of another genus: Lithobates.